Extensive sitemap, subscription information, FAQ, and metablog posts tailored toward the explanation of Gray House. On the second floor, there waits the unassuming and anonymous centerpiece of the House; a stone fountain surrounded by the giant leaves of fig and bamboo trees under the glow from cheap track lighting installations. The shiny faces from wishful pennies are blurred by the gently rippling water. The brownish-gray tile flooring is the same found in hundreds of public bathrooms and squeaks under your shoes through the Courtyard; the Gray Family homage to the Sherman Oaks Galleria, circa 1983. The parameters of the Courtyard form a dodecagon, each of the 12 walls with numbered doors at their centers. 12 doors and none match in color or material or weight but only in measure; their own and their distance away from the next. These are the doors to the Clock of Bedrooms. Check out the Gray House Guide & FAQ. Whether you're just curious to know more about how this experiment of ours works or you're seriously considering a subscription, it'll be a deeply informative read with an chance to submit more questions if you see that we've neglected to explain something. Just subscribed? Wander aimlessly the House or find a more linear way to proceed by following the Your Involvement section of the FAQ. The Gray House experiment is an arts and literature movement wherein fictional characters come to life online and interact with real people, together creating an addictive and darkly magical world of make-believe. This is the headquarters of the fully-interactive role playing experiment. Made of many moving parts and no shortage of things to do, here you’ll find live updates, artistic prompts, and endless possibilities for collaboration with the fictional Gray Family, played live by Evelyn Waits and Rosie Room. Gray House is an imaginary world of strange corridors and bottomless rabbit holes. Upon subscribing to the site, you’re pulled into a vast multimedia experience of the other 12 Gray Family members’ lives. This includes, but is not limited to games, audio recordings, visual art, letters, confessions, Spotify and Youtube playlists, narratives, poetry, dream records, memories, collections of data for consideration, dissertations on existence, and intimate conversations. Around every corner, you’re given the opportunity to contribute to the completely improvised stories being shaped into realities, as the 13th Gray Family member: Jack. Subscribing means “coming home” to Gray House and engaging in a coup d’état against reality with us. You choose your own level of involvement, from silent bystander to earth mover or anything in between. There are no rules and no expectations but that you pretend you’re living with us, which we make easy to do with the immersive venue that is the new website. Updated in real time, there’s always something new to experience and react to. You’re given a rich array of content and then prompted to write scenes, interact with the characters through text message and letters, submit ideas, journal your experience, solve mysteries, and make mixtapes. Whatever the Family inspires in you, you’re urged to create and given an avenue to do so. A meta exploration of the relationship(s) between Evelyn Waits and Rosie Room. 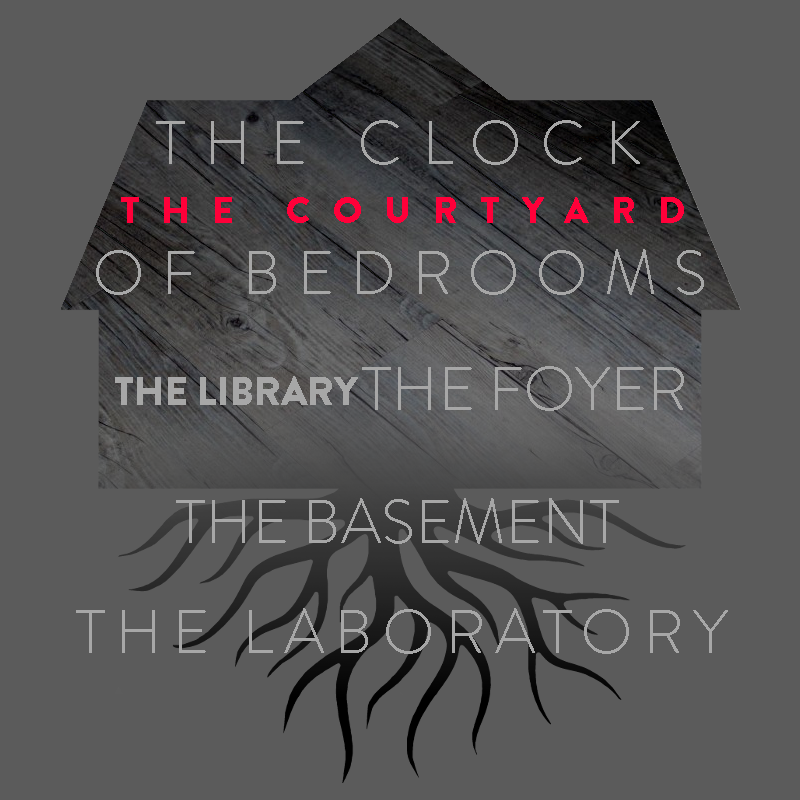 Information on the creators and initiators of the Gray House experiment, Evelyn Waits and Rosie Room. The birth of Gray House. An extensive site map revealing what's available in every room and outlining possible paths to take through Gray House depending on what you'd like to experience. Click through the house to see what's available in each room. Jack perpetually makes her way down the Driveway only to turn around again and go back to pretending none of us exist. Will this time be different? The entryway. This is the dashboard of Gray House. This is the page to bookmark for subscribers. Located on the second floor, the grand, spiral staircases in the Foyer lead up into the Courtyard. A terracotta-tiled, dodecagonal room with a giant fountain in the middle, this is the center of the Clock of Bedrooms. +Metablog posts tailored toward the explanation of Gray House. Also known as The Salon. This is Gradient's room, located in the 12 o'clock position among the dodecagon of doors we call the Clock of Bedrooms. Also known as The Play Room. This is Joshua's room, located in the 1 o'clock position among the dodecagon of doors we call the Clock of Bedrooms. Also known as The Museum. This is Matthew's room, located in the 2 o'clock position among the dodecagon of doors we call the Clock of Bedrooms. Also known as The Love Letters Drawer. This is Adam's room, located in the 3 o'clock position among the dodecagon of doors we call the Clock of Bedrooms. Also known as The Confessional. This is Nicholas' room, located in the 4 o'clock position among the dodecagon of doors we call the Clock of Bedrooms. Also known as The Music Room. This is Dean's room, located in the 5 o'clock position among the dodecagon of doors we call the Clock of Bedrooms. Also known as The Delorean. This is Brad's room, located in the 6 o'clock position among the dodecagon of doors we call the Clock of Bedrooms. Also known as The Secret Room. This is Rosie's room, located in the 7 o'clock position among the dodecagon of doors we call the Clock of Bedrooms. Also known as The Magic 8 Ball. This is Clyde's room, located in the 8 o'clock position among the dodecagon of doors we call the Clock of Bedrooms. Also known as The Dream Room. This is Evelyn's room, located in the 9 o'clock position among the dodecagon of doors we call the Clock of Bedrooms. Also known as The Memory Box. This is John's room, located in the 10 o'clock position among the dodecagon of doors we call the Clock of Bedrooms. Also known as Jack's Room. This is your room, located in the 11 o'clock position among the dodecagon of doors we call the Clock of Bedrooms. The Basement is located under the Library and Foyer. The Laboratory is located under the Basement. This is where you can experience and add to the roughest edges of Gray House with our unedited notes, ill-advised experiments, and the logical organization of the information so chaotically chronicled in the above rooms. We like to play guessing games as to what Adam's notes could possibly mean. HOW DO YOU WANT TO EXPERIENCE GRAY HOUSE? We, the Gray Family, don’t really believe there’s a difference between our categories. All playlists could be considered confessions, all dreams are memories of past lives, all secret worlds come with their own philosophies and that relationship is just the definition of mythology. Everything in Gray House, without exception, could be said to be a game of identity. Let’s be real, literature is visual art because you experience it with your eyes. This categorical arrangement of things is just a lot of blurry lines to give the impression of organization in the dense collision of meaning and experience that we have to sift through in this House. To try and explain the otherwise unexplainable. To put any words we can find onto the magic we touch every day. Enjoy, but don’t be afraid to get lost. You can take our categories and tags with a grain of salt or try to more specifically define them for yourself. Either way, it’s important to note that all the content on the site (past and present) is sorted differently in the Library. There, you’ll find posts connected by story line. That’ll be a shelf for Rosie and Brad’s Nightmare on Elm Street adventures, John and Grady’s necromantic shenanigans, or Clyde’s attempt to make us all rewrite the Holy Bible, for example.